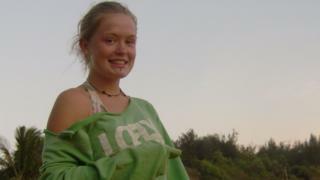 Two men have been cleared of all charges over the death of 15-year-old Scarlett Keeling on a Goan beach in 2008. Placido Carvalho, 48, and Samson D'Souza, 37, faced charges of culpable homicide and grievous sexual assault at Goa Children's Court. The teenager, from Bideford in Devon, was on a six-month "trip of a lifetime" to India with her family when she died. Her mother Fiona MacKeown said she was "devastated" about the verdict. "I am reeling," she told reporters outside the court. "It's been eight years of agony. I feel devastated and will definitely be challenging the verdict. "We had been waiting all this time and it's just rubbish. India's whole judicial system has totally let me down." At a later news conference she claimed the local police were "corrupt". "The medical evidence confirms that my daughter Scarlett was grievously assaulted, raped and murdered after some criminals gave her alcohol and cocaine," she said. "Right from the beginning I knew that the local police did not want to prosecute the killers. It took a huge effort from me even to get the police to register a complaint. "The criminal justice system protects the criminals and not the tourists." It took a matter of seconds for the president of Goa's Children's Court to give her verdict. There was a moment of silence as the packed courtroom took on board what she had said. Scarlett Keeling's mother, Fiona MacKeown, was visibly shocked. Samson D'Souza, one of the two accused, smiled as he left the court. He told the BBC he had always been confident that he would be acquitted. "There was no evidence against me", he said. Ms MacKeown and her lawyer are now meeting to discuss whether to appeal the judgement. Media caption"I feel like I've had the wind knocked out of me. I don't know what to do next"
After the case concluded, Samson D'Souza told reporters: "I am happy with the verdict. Justice has prevailed." Defence lawyer Marvin D'Souza said the investigation had been influenced by diplomatic pressure and trial by media. But Ms MacKeown said she wanted Judge Vandana Tendulkar to make public her reasons for acquitting the men. "I can't begin to imagine where she was coming from," she said. "I want to see her judgment and I want to scrutinise it and then I'm going to show it to the whole world - so it better be good." Scarlett's bruised and partially clothed body was found on Anjuna beach just after dawn on 18 February 2008. The family had spent two months at the Goan resort before travelling down coast to Karnataka - but Scarlett was allowed to return to attend a Valentine's Day beach party. She was left in the care of 25-year-old tour guide Julio Lobo, Ms MacKeown said. "That's the last memory I have of her, squealing and being excited because I said yes," Ms MacKeown has recalled. "I have to live with that every day that I let her go." Two days after Scarlett's body was discovered, her mother found her sandals, pants and shorts close to the beach. "There was no investigation," she has said. The police in Goa initially concluded the teenager died accidentally but, after a campaign by her family, a second post mortem in March 2008 revealed she had been drugged and raped before drowning in seawater. Traces of cocaine, ecstasy and LSD were found in her system. She suffered 50 separate injuries in the attack, the court was told previously. The case was taken up by India's Central Bureau of Investigation and Mr D'Souza and Mr Carvalho were arrested in March 2008. They were charged with culpable homicide, grievous sexual assault, destroying evidence, assault with criminal force with intent to outrage a woman's modesty and administering drugs with intent to harm. They denied all the charges. The prosecution alleged that Mr Carvalho and Mr D'Souza, who was working at a beach-side shack near where Scarlett's body was found, had plied her with drugs then attacked her. But it took two years for the trial to begin, in March 2010. With 72 witnesses to be called, the court case was expected to last a year but prosecutor SR Rivonkar resigned the following February, causing further delays. By December 2013, 30 witnesses had given evidence, with dozens more to go. Along with the delays in court, Ms MacKeown had to wait four-and-a-half years to bury her daughter. She was finally laid to rest in June 2012, in a garden at the family's home in Devon.